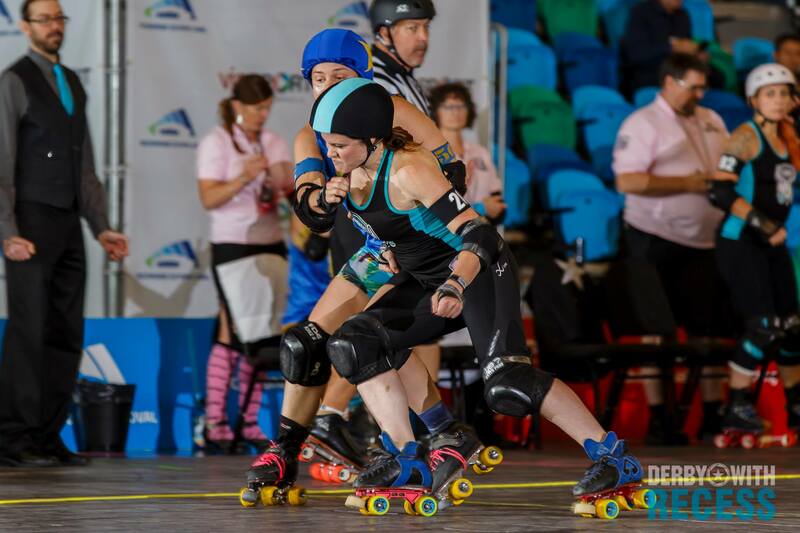 Our latest featured skater is one of Queen City Roller Girls’ Canadian imports, Murphy. Next week, Murphy is heading to Atlanta, Georgia with our A-team, the Lake Effect Furies, to represent Buffalo at division 1 playoffs. Murphy began her career with Niagara Roller Girls in 2012, where she played three seasons in their house league, before transferring to QCRG in 2014. In her first season with QCRG, she made the Furies, in addition to playing for the Devil Dollies. 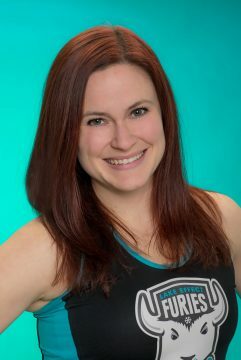 She began her career with the Furies as a jammer, before transitioning to playing as a pivot full time. She is a fierce and intense blocker with excellent pack awareness and edgework. 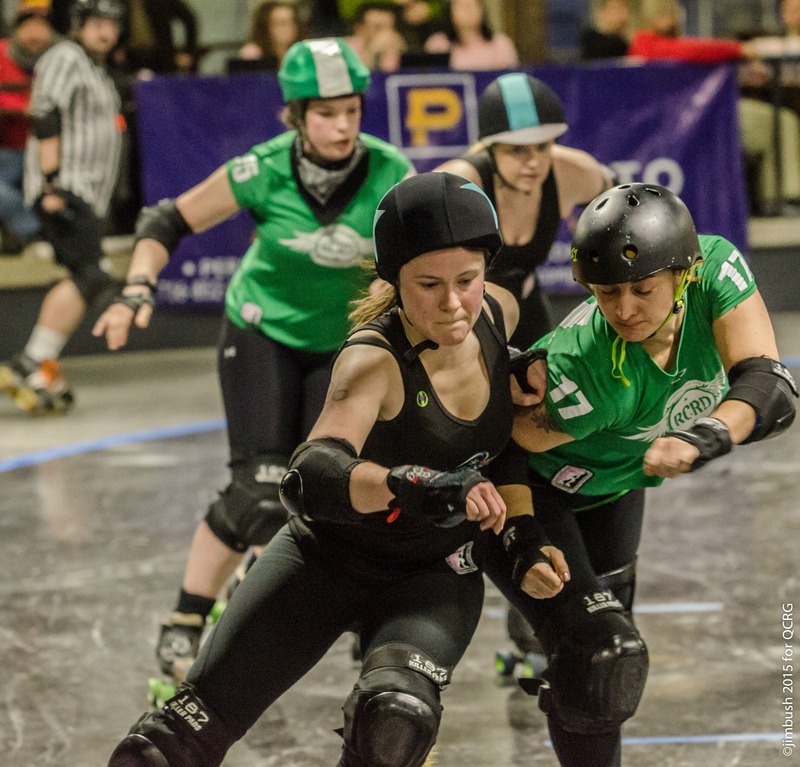 QCRG has recognized her skill as a player, and voted Murphy Best Pivot in both 2017 and 2018 at our annual awards banquet. 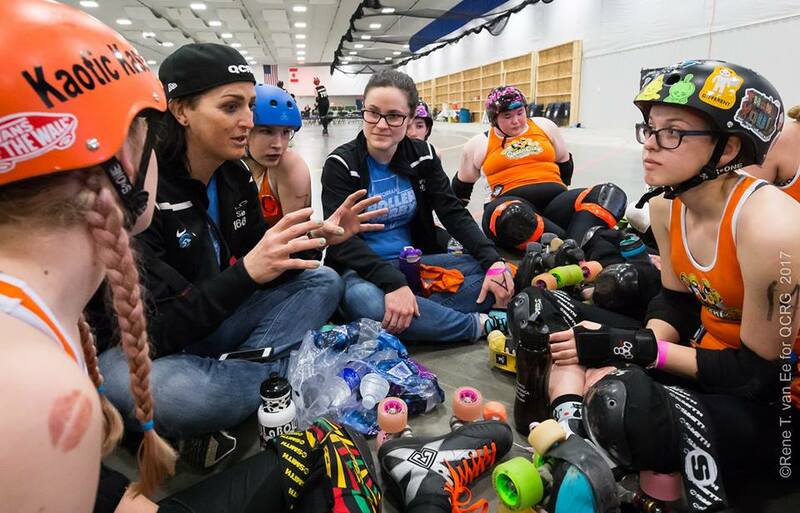 In addition to representing QCRG in internationally ranked division 1 roller derby, she also co-coaches the Queen City Junior Roller Girls travel team. 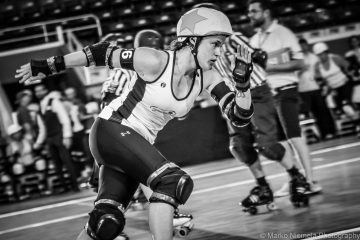 On and off the track, Murphy has a powerful and infectious passion for the sport of roller derby. I’m originally from Innisfil, Ontario, but I have lived in St. Catharines for the past 13 years. I am a Child Protection Worker. 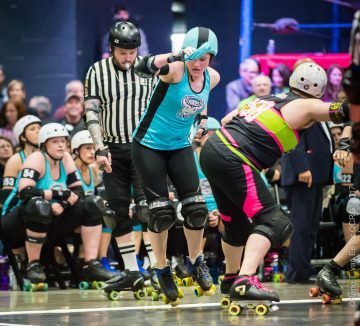 What are your hobbies outside of roller derby? 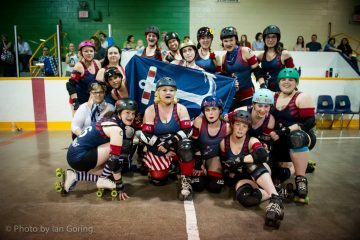 You began your derby career with Niagara Roller Girls, where you were the captain of the Seaway Sirens. What did you enjoy the most about this experience? I had the very unique experience of captaining a team for its first 3 seasons in a sport that we were all very new to at the time. Our team lost every single game in the first season and we used that learning opportunity to work towards becoming stronger and smarter as a unit. We remained accountable to each other by attending nearly every practice and also watched lot of higher level derby together to improve our derby literacy off the track. Our hard work paid off by the end of our third season and we won the championship. Although winning a league championship was a pretty rewarding feeling, that isn’t what I enjoyed most about my experience with my first team. I loved being able to work hard toward a mutual goal with a group of motivated, strong and diverse women. I fell in love with roller derby due to my time with the Niagara Roller Girls and am so grateful for the experiences I had in those formative derby years, not to mention the invaluable friendships that I have gained. What was it like transitioning from a small town derby league to the Lake Effect Furies? Oh my. So many feelings. Leaving my home league was hard. I transferred to QCRG with the goal of one day making the Furies and competing in higher level sanctioned play. I really didn’t expect to make the team in my first season, but the Furies took a chance on me. My first season was a wild ride…The practices were very challenging and I was getting a lot of really great training and learning so much. I went from being a heavily relied upon player on my former team to being a relief jammer on my new team. It was really difficult for me to let go of that feeling that the outcome of the game rested highly on my performance, and looking back, I think I put way too much pressure on myself that year. Fortunately, I was surrounded by strong and inspiring athletes and coaches who helped lift me up and stay motivated to keep trying hard. I went from only ever playing house-league derby in a non-WFTDA league to jamming against Gotham in the span of less than a year. What!? Follow your derby dreams kids! You spent your first season in the league as a jammer. You are now a full time pivot. What did you learn from training as a jammer? I feel that my experience as a jammer helped shape my blocker-self’s understanding of what jammers both love and hate… As a jammer, I played with a lot of panic and didn’t always communicate well with my offense. As a pivot, I try really hard to understand the diverse strengths and styles of each jammer on my team and work within that framework for how I can best help them. From a defensive perspective, I am very familiar with what makes a jammer tired so that helps! Haha. What is the most challenging thing about blocking? As a blocker, you don’t have time to dwell on anything. If things go poorly, you need to reset very quickly while the game is happening, or within a very short break on the bench. Your success is dependent upon your whole line’s ability to maintain the same focus and play as a unit. You can take the best 4 skilled blockers in the sport and put them on a line together, but if they aren’t communicating with each other, then they won’t have a lot of success. Finding the right kind of communication that works for everyone on the line is what I think is a very challenging part of blocking. You have been to playoffs with the Furies many years in a row now. You have played some very tough teams. What is the division 1 tournament experience like? It’s kind of surreal. The intensity is very high on the track. Everyone on each team is there to prove something. I usually find myself slightly intimidated at first, as I’m surrounded by all these strong athletes who I respect and admire, but after the first whistle, I don’t even remember who they are and I just enter beast-mode and play hard with my team. Playoffs is the most fun. It’s a full weekend of great derby and quality time with your teammates. When you work so hard to get there, it’s important to remember to have fun and let yourself enjoy the ride. 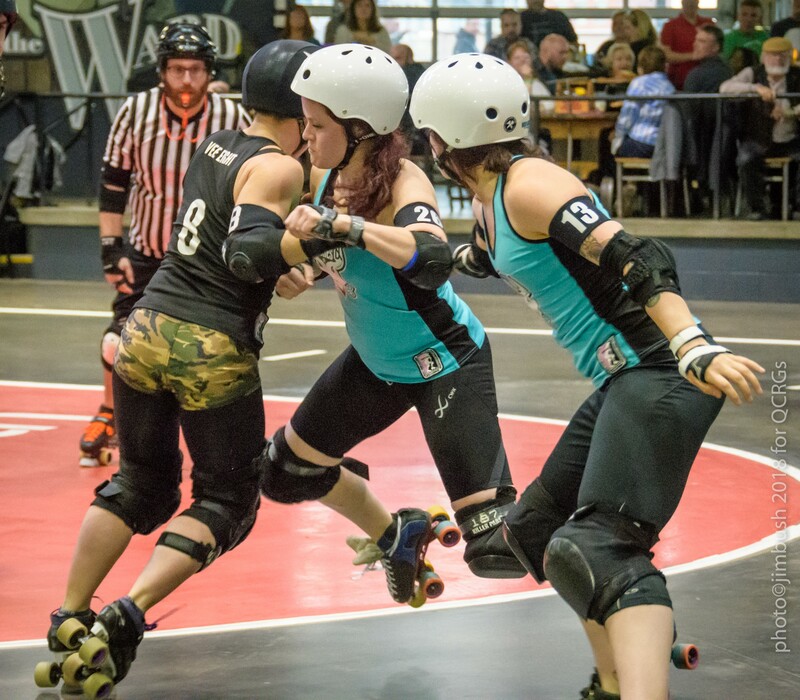 When the Furies played Gotham in 2015, you managed to get lead jam on Bonnie Thunders. What was going through your head when you heard those two whistles? Full disclosure: I was terrified. If it weren’t for the killer offense on the inside by B’kini Whacks that allowed me to run for my life, I never would have snagged that lead. Before Bonnie got ahead of me, I was extremely excited and in disbelief. This lasted for approximately 2 seconds and she caught up to me and jammed defensively to slow me down. As it turns out, the strategy worked. I slowed down. I got 3 points in that jam though and they might be the hardest 3 points I have ever earned. You played one season in our house league on the Devil Dollies. What did you enjoy the most about being on a home team? IT WAS SO MUCH FUN! The Dollies were very welcoming to me as a new skater in the league and I gained some great friendships from the experience. From a training perspective, it helped me to get a lot of reps in as a jammer in a more relaxed environment, which in turn assisted in my development for the Travel Team. You are currently one of the coaches of our junior travel team. What is your favorite thing about being a coach? What is your favorite thing about junior derby? My favourite thing about being a junior coach is helping young athletes channel their inner-competitive self. As young women, we are socialized to be polite and unassuming, and we constantly downplay our own abilities and potential. I love helping skaters build confidence in their abilities and learn to see themselves as the strong athletic young powerhouses that they are! I have honestly learned more from being a Junior Derby coach than I ever could as a skater. It is an entirely new challenge that I am so happy I stumbled upon and I feel very privileged to play a small role in helping to develop the future of our sport. The Juniors are coming for all of us and y’all better be ready! You skated for Team New York in the BOTAS tournament this year. What was this experience like and what did you learn from it? It was interesting! It was a lot of fun to play with skaters from other leagues that I had never played with before, and adapt to new systems and strategies as the weekend went on. It felt pretty cool to represent QCRG and the Furies at an All-Star tournament alongside some skaters from very high-ranked teams. We received a lot of positive and constructive feedback throughout the weekend and gained some new friendships and training ideas along the way. Your husband, Dylan, is the force behind The Apex as well as the head coach of Tri-City Thunder. You both share the mutual interest of derby, which is not always the case for many “derby widows.” What is it like having a partner who is also participating in the world of roller derby? What kind of derby-related activities do you guys do together? Dylan does indeed love the derby as much as me. I feel really lucky to have a partner who not only supports me in my goals within the sport, but plays an active role in trying to help the sport grow and evolve. I love that the Apex has grown into such a crucial derby media site. As for derby related activities we like to do together? We do a lot of derby related things together, but when we have time, we both love skating outside at the Hamilton Harbourfront. What do you do for your off skates training? I’m a big fan of plyometric training and I find lifting weights to be pretty darn rewarding and fun. I have big offseason goals of improving my personal off skates training program because right now, it’s not as intense and organized as I’d like it to be. Do you have any favorite roller derby players? Yes. My list of favorites is ever-growing. My whole Junior team are my favorites. My Furies teammates are all my favorites. Also, I’m always very inspired by brand new skaters with a lot of heart and determination. Watching QCRG’s Queen’s Court compete at the Fresh tournament this year was super exciting and I was so impressed by their understanding of the game and competitive drive despite being so new to the sport. 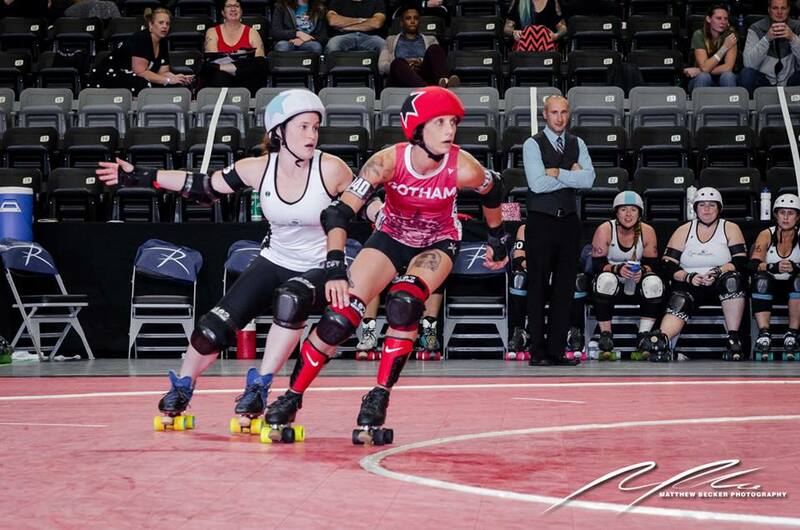 If we’re talking about WFTDA skaters at the top level, I do have one favorite: Smarty Pants. She is arguably one of the smartest and most innovative derby athletes and has always been an excellent role model for me in shaping my own goals as a skater. 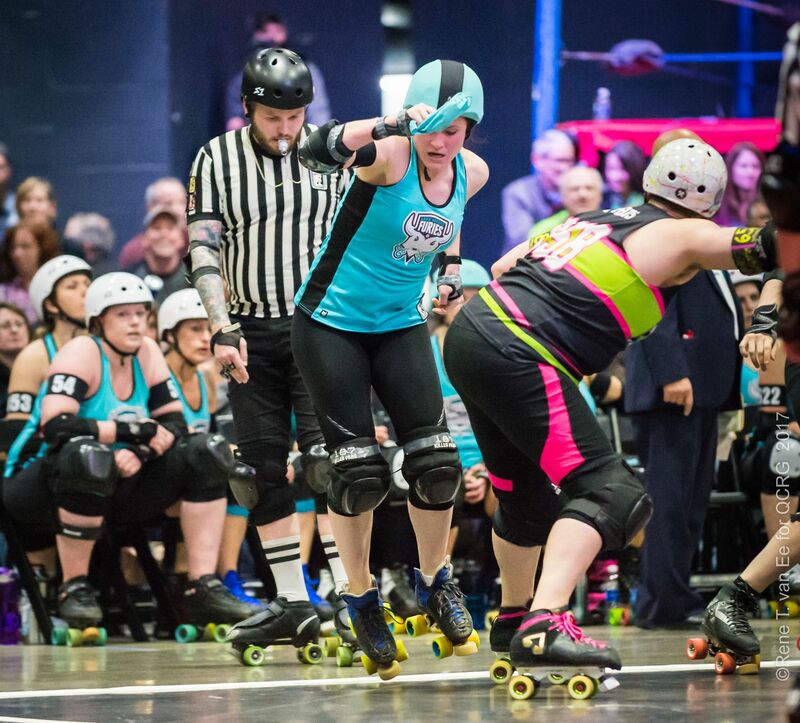 What would you like to see happen in the future of roller derby, as a sport? I want the world to know that roller derby is a legitimate sport that requires a high amount of strength, fitness, and attention to strategy. I want to reach the day where someone finds out I play roller derby and they don’t ask me about what I wear, or whether I fight people or elbow them in the face, or when my next “show” is. I want this sport to get the respect and recognition that it deserves. I am a competitor and I want to continue to work hard with my team to strive for the highest opportunities we can possibly reach. I do plan on continuing to play at a competitive level for as long as my body will allow me. With that said, when the day comes where that is no longer possible, I hope to continue being a part of the sport in other ways, likely in a coaching role as I adore coaching about as much as playing. I’m sure there will be some breaks and time away from the game in between that. The great thing about derby is that it’s always there regardless of the time you choose to spend pursuing other things.